the studio's first big star was a bald-headed, white-bearded, pot-bellied hayseed named Farmer Al Falfa. Al (whose name later became Farmer Alfalfa, one word, as evidenced by occasional sightings of it spelled out on screen) goes back to Terrytoons founder Paul Terry's first regular gig in animation — churning out a cartoon a month for J.R. Bray's screen "magazine", Paramount Pictograph. Other famous toon men who worked for Bray in their early years include Max Fleischer and Walter Lantz. 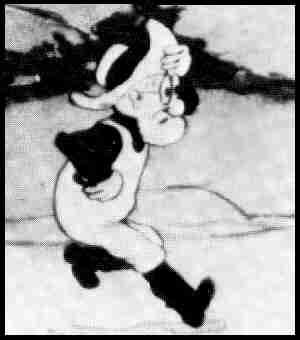 Terry's first cartoon for Bray was Farmer Al Falfa's Catastrophe, which was released Feb. 3, 1916. Between then and the early part of 1917, when Terry went off to fight in World War I, Farmer Al Falfa starred in about a dozen cartoons. Right from the first, he reflected Terry's penchant for saving time and cutting cost — Terry designed him to be animated easily, with separate cels for various body parts so the whole figure didn't have to be re-drawn for each frame. After Terry returned from the war, he went back to producing cartoons for release by Paramount. Only five, released between 1920 and '23, had Al as their title character, as Terry concentrated mainly on his "Aesop's Fables" series (no relation) — but many of the "Fables" took place on or around his farm, and he appeared in them frequently throughout the 1920s. As before, quality took a back seat to reliability — Terry's cartoons weren't masterpieces of creative genius, but distributors and theatre owners could depend on them, because they came out on schedule and without cost overruns. Terry struck out on his own early in the sound era, and brought Farmer Alfalfa back as his studio's first recurring character. The farmer's first speaking role occurred in Club Sandwich, released Jan. 5, 1931. Dozens and dozens of Farmer Alfalfa cartoons followed, throughout the early and mid-1930s. But the character, never one of animation's more scintillating ones, pretty much ran out of steam as the '30s wore on. By 1937, he was well on his way to being supplanted by Fanny Zilch, Gandy Goose and other newly-minted Terry stars. His last starring role was in The Dancing Bear, released Oct. 15 of that year. Even after his series was dropped, however, Alfalfa continued to turn up in other characters' cartoons, until well into the 1950s. In fact, he lasted long enough to appear in Cinemascope, a rare achievement for anybody who started in silent films. He was reinvigorated in the 1950s, as old black and white cartoons found a new market in television. Tho the passing years hadn't conferred any additional entertainment value upon him, he, Bosko, Scrappy and other headliners of the pre-color days became familiar sights to kids of the Baby Boom generation. CBS bought the studio in 1953, and made him a regular on Barker Bill's Cartoon Show, tho for some reason they renamed him "Farmer Gray" in this venue. Three years later, his old name was back, as he hosted and starred in the lead segment of the syndicated Farmer Alfalfa & His Terrytoon Pals. But the day came when even television, with the vast, empty hours it needs to fill, was no longer a very large market for black and white cartoons — and while Alfalfa did last until the color era, the vast majority of his cartoons were monochrome. The old Terrytoons characters have all disappeared from TV by now, but Farmer Alfalfa disappeared long before the others. Text ©2002-09 Donald D. Markstein. Art © Viacom, Inc.